The Britax Parkway SGL is a new version of the popular Parkway SG Booster. We had a preview of the SGL from our ABC Kids Expo coverage. It is rated for kids 40-120 pounds. You can find our full review of the original Parkway SG here. Using the Parkway SGL in high-back mode with the backrest, it is rated for kids 38-63 inches tall and with a seated shoulder height of 15-21.5 inches tall. We recommend that kids remain in a child restraint system with a 5-point harness until they are at least 4 years old and 40 pounds, preferably until they are mature enough to remain seated properly in a seatbelt with a booster. Kids should remain in a booster until they can pass the 5-step test. ISOFLEX sytem. This LATCH attachment system stabilizes the Parkway SGL during loading and unloading. When unoccupied, it prevents the Parkway SGL from becoming a flying hazard. It uses premium attachments with push-button releases. A quick pull on the strap from either side of the booster tightens both attachments at the same time! It is very easy to use . Updated Secure Guard clip. The new clip has a single strap and is nicer in appearance than the 2-strap design on the Parkway SG. It is a little easier to use than before, but can be a bit tricky to remove and adjust. Updated armrests. The armrests lost their fabric cover and are now overmolded with rubber. They are close to one-half inch higher than before. Revised shoulder belt guides. Perhaps combined with the slightly higher armrests, this could improve the fit of the shoulder belt for some kids in certain vehicles. More importantly, it is easier to thread the shoulder belt from the bottom on the new design, rather than from the back on the old one. The Parkway SGL is made in China. Like various high-back boosters, some assembly is required. It isn’t difficult, but you should follow the instructions carefully. Assemble on a flat surface and make sure everything is aligned correctly whenever you attach the back or remove it for backless mode. Overall, the Britax Parkway SGL is a very nice update to the Parkway SG. 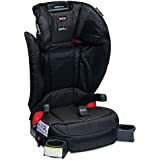 Britax has done a nice job updating many of their products within a year or two, partly in response to suggestions from parents. The tall height and unique Secure Guard feature make it a very good choice for a high-back booster, plus it converts to a backless booster as well. LATCH is a handy feature that sets it apart from many other boosters. The Parkway SG was an IIHS “Good Bet” and due to the similarities, I expect that the Parkway SGL will be rated as just as good. The official link for the Parkway SGL at the Britax USA website can be found here. The review sample shown in the photos was supplied by Britax USA. Beyond providing the retail sample, no money or other type of compensation was provided and no content was submitted for inclusion in this review. It stays latched the whole time. So after they are buckled in, before you drive off, do you unlatch it? or does it stay latched the whole time, with or without a kid in it? You’re kids are so sweet to do those review pics and videos – so helpful! My 4 year old has another year or so in his harnessed seat, but I am really liking this booster because of it preventing submarining and because it has latch! It feels like a safer option between a harness and a traditional hbb 🙂 Excellent. Thanks so much for the review – I was trying to decide whether the SGL was worth an extra $25 and your review was very helpful! Yeah baby! Jonathan is adorable. Do you find it harder for kids to buckle their belt with a rigid buckle or a flimsy one? My son seemed right at the point to where the next setting looked OK also. My daughter could have also used one setting taller (the highest one), but it doesn’t actually fit in the Prius at that setting! love the review… but Darren, I’d probably raise the headrest a notch or so on Jonathon… I didn’t like how close to the edge of the shoulder the belt was.